The Hebrew weekly Yorshalim newspaper reported on Friday that rightist settlers had recently erected a tent on a hill near Umm Tuba village, in southern Jerusalem. The new tent was set up on a hill near the back entrance of Har Houma settlement, close to an Israeli police station, in an attempt to create an outpost that will eventually become an extension to Har Houma settlement. The Yorshalim newspaper reported that there is no guard on the settlers residing in the new outpost which is only one street away from Umm Tuba village and that the settlers raised Israeli flags on the tent and the Star of David made of tree branches. Acting Palestinian Authority (PA) Chief Mahmoud Abbas has condemned Israel’s “catastrophic” settlement expansion in the occupied West Bank and its campaign of ethnic cleansing against Palestinians. "Developments over the past year have confirmed what we have persistently drawn attention to and warned of the catastrophic danger of the racist Israeli settlement of our country, Palestine," Abbas told the UN General Assembly on Thursday. 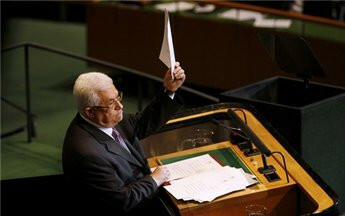 During his speech, Abbas condemned Israeli attempts to change the historic demography of the region through its expansionist policies in the occupied Palestinian territories. He said in the past year alone thousands of Palestinians' homes have been razed and more people have been displaced while restrictions imposed on Palestinians have created a "suffocating situation" for them and made their livelihood very difficult. Abbas told the UN gathering that Israel’s aggressive and extremist policies simply stoke anger among Palestinians, and are killing hopes for a two-state solution. The PA official noted the "relentless" wave of racist attacks “by terrorist militias of Israeli settlers" against Palestinian people, their homes, schools and their holy sites. "They are unleashing their venom against our trees, fields, crops and properties, and our people have become fixed targets for acts of killing and abuse with the complete collusion of the occupying forces and the Israeli government," he added. Abbas demanded the UN Security Council to "urgently adopt a resolution comprising the basis and foundations for a solution to the Palestinian-Israeli conflict that would serve as a binding reference and guide for all." 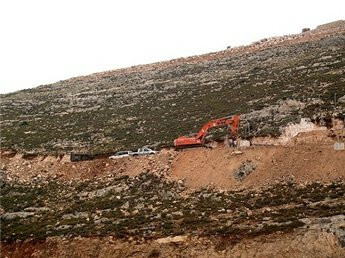 The so-called Israeli Civil Administration Office, run under the Israeli Military in the occupied West Bank, is planning to pave a new road to be used by Jewish settlers, in the northern West Bank district of Qalqilia. The new planned road will be built on expense of privately-owned Palestinian lands that belong to villagers of Izbit At-Tabeeb, Nabi Elias and Azzoun. Izbit At-Tabeeb is located in Area C of the occupied West Bank falling under Israeli military and administrative control, and Israel refuses to recognize it while the residents are facing constant threats of been removed from their own homes and lands. Residents of the village told the Arabs48 News Website that Israeli officials arrived at the village and starting placing markers on the villagers’ lands, and when asked about what they were doing, the officials said that a previously planned settler road will be built soon, and will lead to the confiscation of lands that belong to the villagers of Izbit At-Tabeeb and a number of nearby villages. The residents objected to what was happening and forced the Civil Administration team to leave, and the team said they will be back “under protection of the military”. The Village Council in Izbit At-Tabeeb issued a press release stating that the villages in the area will resist this new Israeli plan, and will continue their nonviolent activities to counter the illegal Israeli violations, Israel illegal Annexation Wall and settlements. It is worth mentioning that Israel also intends to demolish a medical services center in the village under the pretext of being built without a permit. The Popular Committee Against the Wall and Settlements in the village said that its weekly nonviolent protest this Friday will also be held to resist this new plan, and called on Israeli and International peace activists to support their protest and help the residents defend their homes and lands. 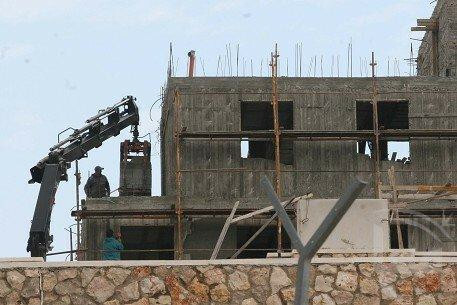 Israeli Occupation Authorities (IOA) began to build 300 housing units near the town of al-Khader, south of Bethlehem in the southern West Bank. The occupation bulldozers started bulldozing the area of "Um Hamdan" to build 300 housing units, Ahmad Salah, Coordinator of the Popular Committee Against the Wall and Settlements in al-Khader, explained. The Israeli army seized Um Hamdan area in 2000, where they established a military camp and check point, Salah noted, adding that this decision came within an Israeli project to convert 40 military camps into settlements. He pointed out that the residents are banned access to their lands, and that the establishment of this settlement will contain 500 dunums belonging to Mossa family. He added that this settlement came within a systematic policy by Israeli officers who have confirmed that the "Gush Etzion" is part of the "Greater Jerusalem" plan. Salah called for Palestinian and international serious attitude to stop the Israeli settlement plans in al-Khader village. Israeli authorities on Monday began the construction of new housing units in an illegal outpost near al-Khader village in Bethlehem, a local activist said. Ahmad Salah, coordinator of the popular committee against the wall and settlements, told Ma'an that Israeli bulldozers began to level land in the area in preparation for construction work, despite the fact that the area was confiscated by Israel 12 years ago on the pretext of security. Israeli forces took control of the area, called Um al-Mohamadeen, in 2000 and set up military watchtowers. 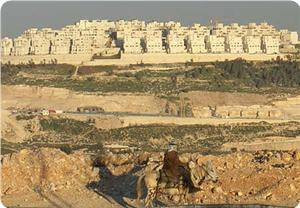 Settlement expansion and land confiscation in the area prevent urban expansion in al-Khader, Salah said. Israel plans to transform 40 military posts across the West Bank into settlements and plans to link different areas of the Efrat settlement bloc south of al-Khader, Salah added. "We have warned several times of the real danger of settlement activities, but nobody is responding to our calls. Even farmers gave up hope," says Salah. Strategically, settlement construction in the al-Khader area is a continuation of Israeli plans to link the settlement blocs of Gush Etzion, Efrat and Gilo, which surround Bethlehem. In late August, Israeli prime minister Benjamin Netanyahu visited the Bethlehem-area settlements, claiming that "Efrat and Gush Etzion are integral parts of greater Jerusalem," Israeli daily The Jerusalem Post said. "They are the southern gates of Jerusalem and will always be part of the State of Israel. 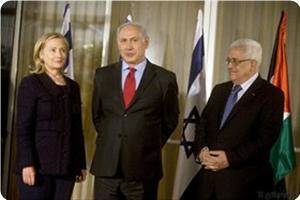 We are building Efrat and Gush Etzion with enthusiasm, faith and responsibility," he said. A report issued by Hamas's Media Office stated that settlement activity and Judaization projects have been escalated, in an unprecedented way, in the occupied city of Jerusalem and throughout the West Bank during the past few months. The report pointed out that the Israeli occupation is escalating demolition operations and notifications within the framework of settlement expansion in different parts of the West Bank, particularly in al-Khalil to the south. It also pointed to the escalation in the confiscation of thousands of dunums of citizens' lands in order to expand the outposts, to open and expand bypass roads used by settlers and to put pressure on Palestinians. 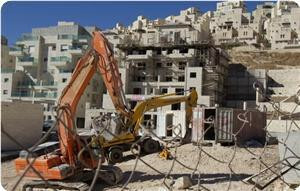 Hamas's report, which monitors settlement projects and settlers attacks during the period between August 16, 2012 and September 15, 2012, said that the occupation is planning to expand more than forty settlements, established on private Palestinian lands in different parts of occupied West Bank, and to legitimize the previous construction operations under the pretext of "military purposes." 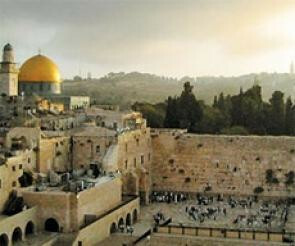 The report also monitored the escalation of Judaization schemes against the city of Jerusalem and Al-Aqsa Mosque, as it disclosed the persistent excavations around the Mosque, the frequent raids into it and the desecration of its courtyards. It also dealt with the criminal and provocative acts committed by the Zionist settlers against Palestinian citizens as well as their lands, their crops and properties. Moriah Jerusalem Development Company will start, during the coming days, building a bridge for pedestrians and cars linking the visitor center of "City of David", established at Silwan's entrance south of al-Aqsa Mosque, and al-Buraq Square's tunnel, passing through Wadi al-Hilwa square. Wadi al-Hilwa's information center reported in a statement released on Thursday evening that the occupation distributed a flyer to residents of Wadi al-Hilwa neighborhood in Silwan town entitled "changes in the traffic", indicating that construction works will be launched in the currently used Main Street, to turn it into a bridge connecting the outpost and al-Buraq Wall. The statement added that the work will extend for several months, from 11:00 p.m until 5:00 a.m, noting that the Israeli police will close the street to traffic. The building works of the bridge will be launched in cooperation between Moriah Company, the occupation municipality, Israeli police and the Antiquities Authority. 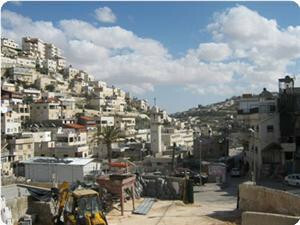 The Information Center in Wadi al-Hilweh stated that the occupation authorities has been continuing the implementation of settlement schemes in the city of Jerusalem in general, and the town of Silwan and al-Aqsa Mosque in particular, without taking into account the needs of the residents and without providing them with alternatives. It pointed out that the Israeli Supreme Court had issued, about a year ago, a decree banning making changes in the main street of Wadi al-Hilwa, after the residents presented objection in the court, against the municipality's announcement of its intention to make changes in the street for the benefit of settlers. The Hamas Movement strongly denounced the Israeli occupation authority for building public toilets on part of the ruins of Al-Maghariba neighborhood near the Aqsa Mosque. The IOA built dozens of public toilets after it completed its demolition of Al-Maghariba neighborhood and wiped out all its landmarks. The toilets were established in the far southwest of Al-Buraq wall in the neighborhood and would be used by Jewish settlers and tourists who visit the area. In a press release on Tuesday, Hamas said that Israel's Judaization schemes in the holy city would never succeed in obliterating its historical landmarks and monuments and changing its Arab identity. Hamas also warned that the Israeli regime would suffer dire consequences if it persisted in its Judaization crimes against Jerusalem. It appealed to the organization of Islamic cooperation and the Arab League to actively move to protect Jerusalem and its landmarks from the danger of Judaization. The Israeli government is seeking court approval for the construction of settler homes on private Palestinian land in more than 40 settlements, an Israeli news report said Thursday. All Israeli settlements on built occupied Palestinian land are illegal under international law. But Israel classes some settlements as legal, while others it says are built without following government and legal requirements, but they often receive retroactive approval. The Israeli High Court ruled in 1979 that the army could no longer confiscate West Bank land from Palestinian land-owners for settlement building, but only for "military purposes." Despite the ruling, Israeli daily Haaretz said the state prosecution admitted in a recent case that 44 settlements were erected totally or partially based on expropriation orders for private land that were initially issued for military purposes. The state argued that the High Court ruling "does not prevent exploiting the potential of these communities (settlements)." 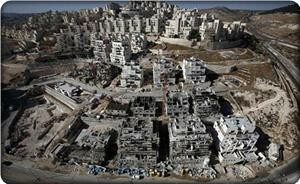 It is asking for court permission to use its judgment in planning settlement construction on private Palestinian lands. 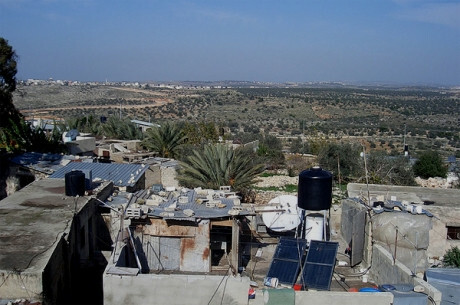 The response was made in a case brought by a Palestinian from Ramallah village Dura al-Qara against the expansion of Beit El settlement on his land. 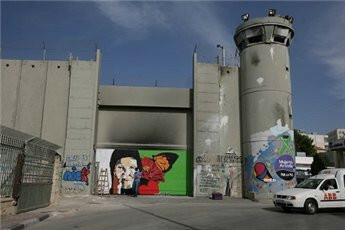 A woman paints graffiti on a section of Israel's wall near Rachel's Tomb in Bethlehem. Israel's Nature and Parks Authority has rescinded its consent to build the separation wall around the village of Battir, the Israeli daily Haaretz reported Thursday. No state agency has ever opposed the construction of the wall in any area before, Haaretz said. The Nature and Parks Authority wrote to the Israeli Defense Ministry warning of damage to Battir's landscape and relations with villagers, and demanding the ministry find an alternative route for the wall. The authority had reached a compromise with the ministry six years ago on the route of the wall, but is reneging on its consent. "No matter how narrow the route of the fence, it will be a foreign engineering element in the heart of the agricultural terraces and separate the village from its lands, among which are plots irrigated by spring water," the INPA said, Haaretz reported. The wall will also lead to the extinction of wild animals by inhibiting their movement, it noted. "The struggle of our neighbors to name the area a World Heritage Site places us in an embarrassing position, and we should work together with them to protect the landscape," the agency added. The Palestinian Authority has asked UNESCO to add Battir to its World Heritage List. Battir uses an ancient system of irrigation that has provided fresh water to the community for centuries. The proposed route of the wall will damage the terraces used for irrigation and cut off villagers from their fields and source of income. In 2004, the International Court of Justice issued an advisory opinion calling on Israel to stop building the wall and dismantle or re-route sections that had been constructed. Israel says the wall is necessary for its security but Palestinians say it is a land grab, noting that it is not built on the Green Line and in places runs deep inside the West Bank. The Israeli Nature and Parks Authority noted in its complaint that residents of Battir were the only Palestinians allowed to enter Israel before 1967 and the villagers had maintained security in the area. "The case of the lands of Battir should be studied. It is a ray of light showing different relations with our neighbors built on shared interests," the authority said.